Phoenix GaminG is delighted to announce our partnership with major computer hardware and gaming equipment company Gigabyte Technology. Phoenix GaminG and Gigabyte have agreed to work together in the future to uplift and improve gaming in Sri Lanka in terms of developing esports athletes to aid them in their gaming careers. Gigabyte is a Taiwanese manufacturer and distributor of computer hardware and gaming equipment. One of the world’s largest PC technology companies. Gigabyte is a common brand associated with gaming across many games in all parts of the globe. Premier esports teams such as G2 Esports, G-REX, OMG and Gigabyte Marines are all sponsored by Gigabyte’s subsidiary AORUS. Gigabyte has a large portfolio of products under its name. Its main product is the world class motherboards such as the AORUS Z390. Other than that Gigabyte produces graphic cards, laptops (the sleek Aero 15x), PC peripherals and other PC components. Gigabyte has set industry standards with its high-end monitors (AD27QD) that are now used in many major international gaming tournaments. AORUS is a premium gaming brand powered by Gigabyte. It features all products essential for gamers to take them to professional heights. AORUS is a community driven brand that takes gamers’ desires to heart and tries its level best to cater to all gamers’ needs and that’s what makes it the idea gaming equipment partner. 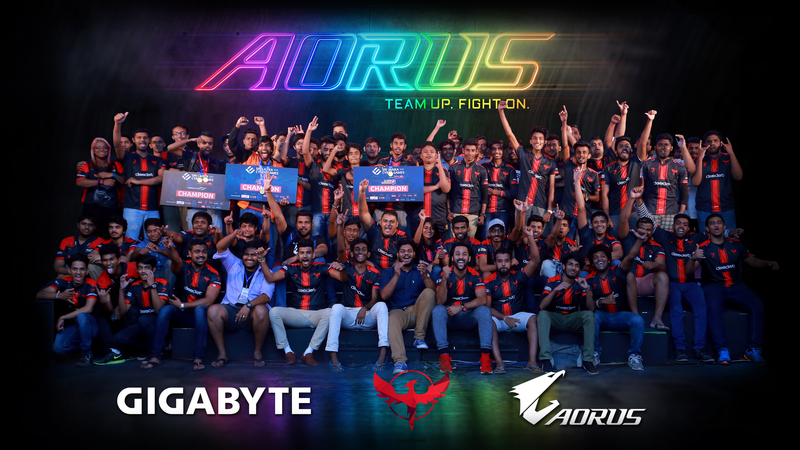 Phoenix GaminG’s partnership with Gigabyte and AORUS looks to elevate the level of professional gaming in Sri Lanka, with benefits to members such as higher performance based bonuses and equipment to those that require it. Gigabytes trust in the Sri Lankan gaming scene is a direct reflection of where Phoenix GaminG believes our small gaming community can grow into. Out of the large number of clans in Sri Lanka, Phoenix GaminG were chosen as partners by Gigabyte because of the reputation the clan has built at event management, branding and most importantly being the best clan in the country for a long period of time. Gigabyte believes the unique partnership will add value and benefit to both parties. Phoenix GaminG is thrilled to have the backing of such a large organization for the upcoming years to keep bettering the clan as well as esports in the country.